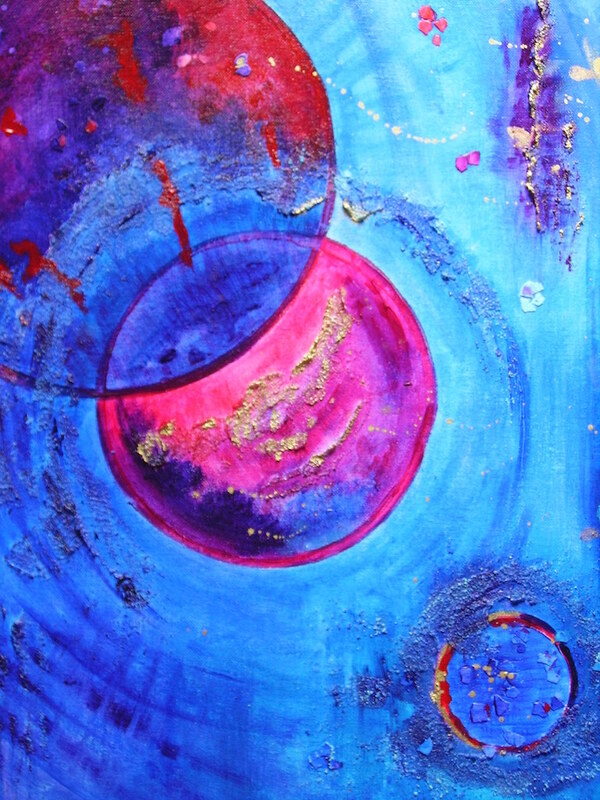 After Blue Monday’s post I decided the write about my many blue paintings to keep the theme going. Blue’s a colour that I don’t wear much (except denim) and wouldn’t decorate my house with as it can be chilly. But I do love blue paint and seeing the colour in well-known artworks. Such as this one by Sassoferrato at the National Gallery in London. Especially from the days when the colour was so expensive to create, hence so valuable. In a painting it’s thoughtful, calming and enriching. It also suggests speech and communication. Plus it represents the throat chakra which is ironically something I need to take care of at the moment. Unsurprising perhaps, it’s a colour I’m drawn to right now. So here are six paintings that I particularly enjoyed doing and a little bit about them. Incidentally, most of them are available for sale via my artist website and Etsy store. I remember doing this painting during a bit of a gloomy period one January after I’d just lost my job. In actual fact it was a bit of a miserable time full-stop. I was recovering from surgery to fix a cut tendon in my hand (all my operations have taken place past the age of forty-four so far! ), back on a miserable round of job interviews and was in the midst of a commission gone wrong. Meanwhile, outside the weather was blowing up a storm and spring seemed so far off. Therefore I did the painting very much indulging my low mood. Looking back on it though, I can see red flashes of positivity in this work. Away from my City job I stopped having end-of-week Prosecco and hanging around the office for no good reason. It wasn’t long before I absolutely hated the taste of any alcohol. In addition, once my tendon had healed I went back to the gym. I started a yoga class there instead with a great teacher called Charlie and met new pals. I’d been doing yoga on and off for years, but this time it became a habit that endured. Thank goodness then that spring did come and things perked up. I was given work elsewhere in the same company (which I liked far more even though I wasn’t paid London rates), I made new friends at work, the ongoing commission-from-hell finally ended and the yoga took off. The colours in Spring are soft and wispy, suggesting gentle dawns and petals. Or soft blue skies and cherry blossom. 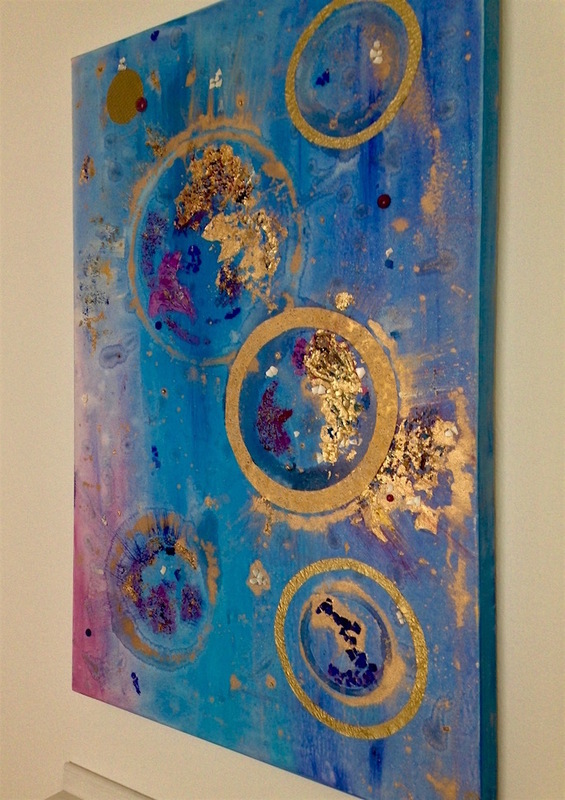 I added some gold textured paper and gold leaf to suggest the promise of what’s to come. And I didn’t actually do it in spring, but in autumn. Which is still spring somewhere in the world, depending on where you are! The title means blue in Italian, simply because I didn’t know what else to call it! It’s an abstract as you can see with lots of good leaf and texture. I’ve mounted onto chiyogami paper then onto thick white paper with a rough edge. 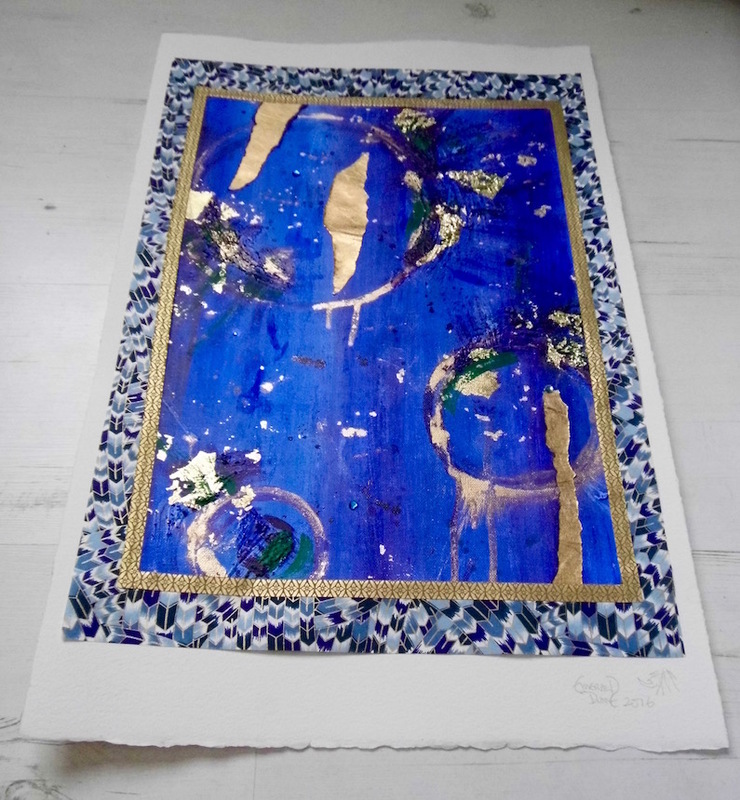 Azzurro is one of an ongoing series of recent works I’ve been doing using this decorative Japanese paper. I fell in love with chiyogami when I was living in Japan and initially used it with my handmade cards. It was only when I sent some to a customer as a thank you for buying a painting that she asked if I made bigger versions. I’m glad asked because it prompted me to develop the theme. Watch out for a couple of posts on chiyogami and how I use it in my work. I’ll be linking to them here when they go live. Oooh, I wish I still had this painting with me as I would’ve framed it by now. And been able to take a much better photo. It’s still in Japan. The title is Projection as I was thinking of all things Jungian when I did it. It woukd take a whole new post to talk about how the ideas of Carl Jung has influenced my work, and that of others. But in a nutshell this work describes the shadow part of our psyche. As well as how our shadows can be projected onto the next generation (unless we put the work in). Nonetheless, there are positive aspects of our characters that we can hand on, hence the vibrant pink and gold. I’m often aware, for example, of the creativity my parents passed on. My dad writes and draws and has been successful with his gifts. But my mum has the greatest imagination and thinks up the funniest stories – but never writes them down! In turn her own mother was a voracious reader and write a lot of poetry and prose. If there’s a lesson here it’s to put it down on paper. A bit of a crooked photo here. 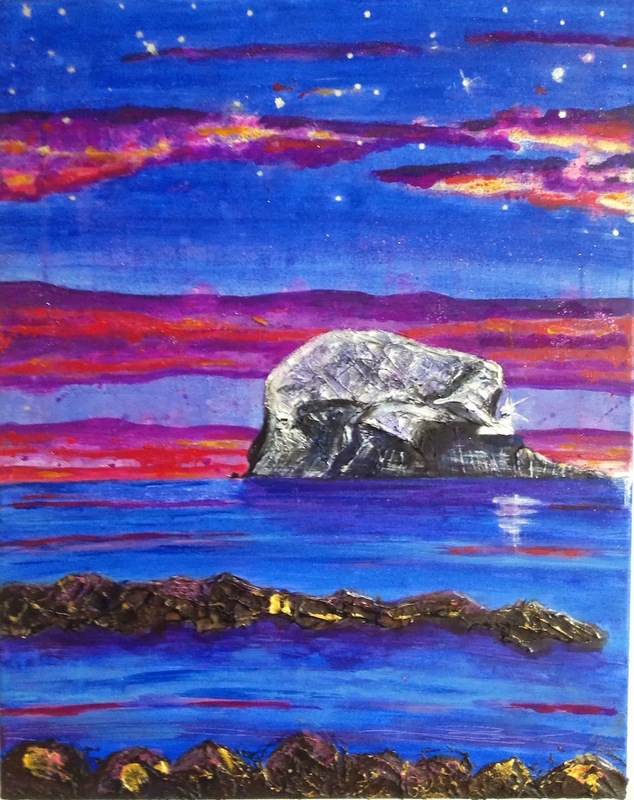 This is one of the string of rock islands off the East Lothian coast by North Berwick. If you read my January Blues post earlier this week, you’ll see that I sketched this particular island last week. 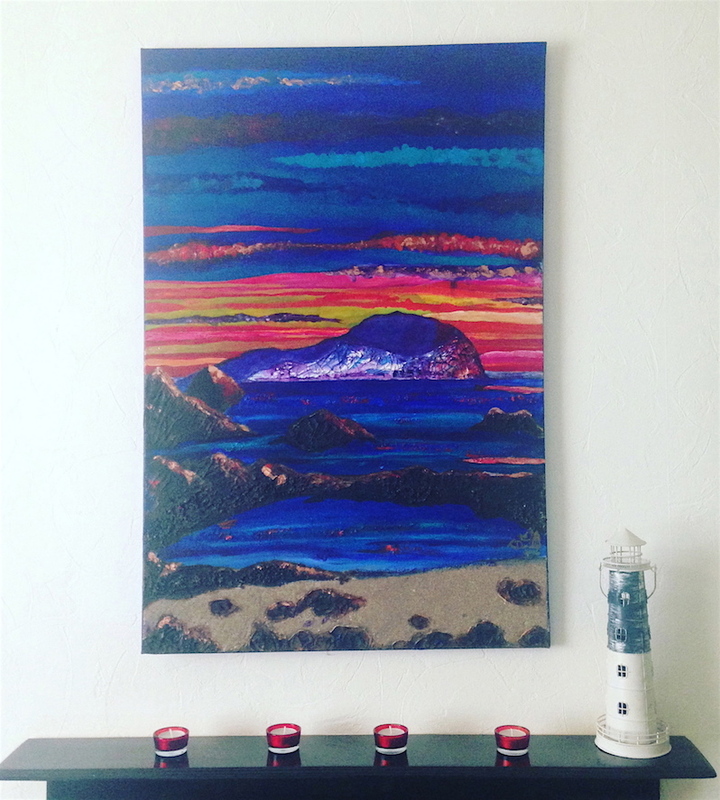 This one is Craigleith, as is the painting’s title. I love sketching its distinctive shape then creating a textured piece from my drawings. I often add real sand to my seascapes. These islands are volcanic plugs and there many more sprinkled across this part of Scotland. Sketching and painting the islands is never the same twice since the sea, sky and light are always in flux. Furthermore, the islands themselves “change shape” as you walk along the beach. However, it’s not a work I’m one hundred percent happy with (as happens!). So right now I’m reworking the sky plus some of the foreground. And I’ll be posting the upgrade here in the not-too-distant future. This painting is now owned by my good pal Cathy Cooper. And Craigleith’s better known sibling, the Bass Rock. If you’re interested in wildlife or geology there’s a good chance you’ve heard of this natural landmark. I’m a bit obsessed about painting it, which is why I’ve turned my hand to the other islands lately. My sketchbook has so many Bass Rocks as the light changes in a flash and there are so many great vantage points to capture it. I painted Here Comes the Dawn using sketches made on the beach since I always prefer to work from life. The sky, however, I did exaggerate and put my own imaginative spin on. Needless to say, this part if the world sees some fabulous daybreaks. Cathy was keen on buying one of my Bass Rocks as she had a fantastic adventure there. And when she found out I still had the original she snapped it up. Meanwhile, I ordered a limited run of prints of this piece, available here. 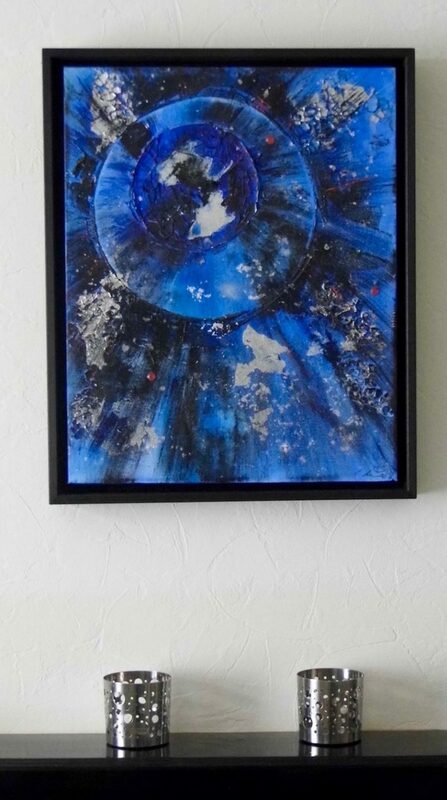 I also love to use blue in my glass work. But that’s a story for another time. As always, thank you for reading. Which colours do you like to use in your art and why? Let me know in the comments. "Work-in-progress: 6 projects to finish in 2018"